A.J. 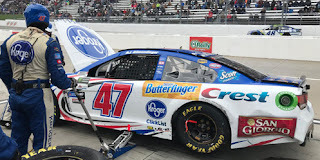 Allmendinger picked up the 7th last-place finish of his Monster Energy NASCAR Cup Series career in Sunday’s First Data 500 at the Martinsville Speedway when his #47 Kroger ClickList Chevrolet fell out with crash damage after 94 of 505 laps. The finish, which came in Allmendinger’s 332nd series start, was his first of the season and his first in a Cup Series race since the March 29, 2015 race at the same track, the STP 500, 98 races ago. 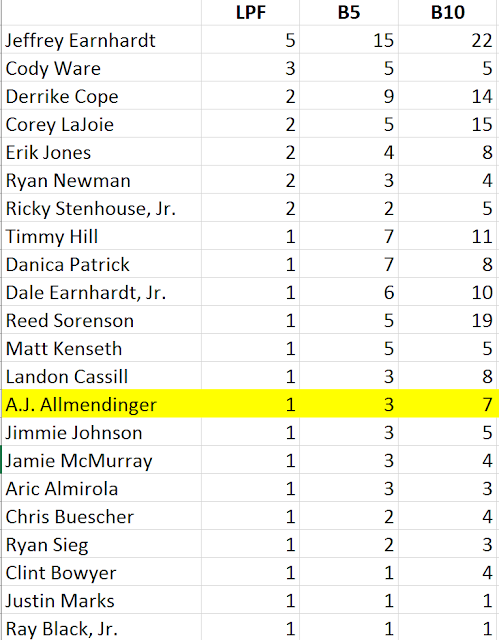 In this, JTG-Daugherty Racing’s first year fielding two cars, Allmendinger has struggled for much of the season. 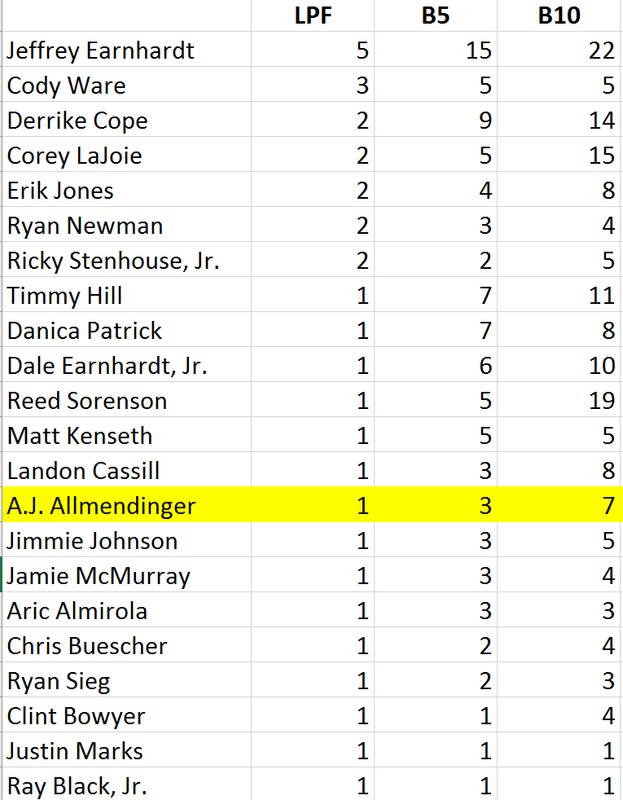 Coming into Sunday’s race, Allmendinger sat 27th in the point standings with just one Top Five, a 3rd-place finish in the Daytona 500, and no Top Tens since a 9th-place showing at Watkins Glen. The #47 team scored just two DNFs in the regular season, but that total doubled just this month with wrecks at Talladega and Kansas. Martinsville looked to be a chance for a turnaround, as Allmendinger scored a pair of runner-up finishes in 2012 and 2016. In fact, in eighteen previous starts, he had finished 15th or better twelve times. In Saturday’s opening practice, Allmendinger again showed promise, ranking 9th in the session, just under two-tenths shy of session leader Denny Hamlin. He then held serve with a 12th-fastest lap in Happy Hour, but stumbled in qualifying for 27th on the grid with a lap of 95.675mph. Starting last on Sunday was driver-turned-broadcaster Hermie Sadler, who was making his first Cup Series start since April 1, 2012, when he finished 31st at the same Martinsville track in Circle Sport’s #33. This time around, Sadler was driving for Tommy Baldwin Racing, which itself has been absorbed into Premium Motorsports to be teamed with Premium’s #15 of Reed Sorenson. After the session, however, Sadler would be joined by three drivers, all sent to the rear for unapproved adjustments. Sent to the rear along with Richard Childress Racing teammates Austin Dillon and Paul Menard was Jimmie Johnson, who spun during his second timed lap in Round 2 and was forced to change his flat-spotted tires. By the first lap, last-place had fallen to Carl Long, who was driving his own #66 O.C.R. Gaz Bar Chevrolet for the first time since Darlington. He was also shaking down a brand-new chassis the team had prepared, just the second car in Motorsports Business Management’s garage. Long lost 15 seconds to the leader in the first three laps, and was the first to be lapped by Joey Logano as the pair crossed the stripe to complete the 21st circuit. Long held 40th until around Lap 40, by which time Michael McDowell had lost a lap following his Lap 36 tangle with Ty Dillon and Ricky Stenhouse, Jr. off Turn 2. McDowell, his #95 Chevrolet debuting new sponsorship from Jolt eyedrops by Rohto, had also shown speed that weekend, running 14th in the opening practice and lining up 20th. As a result, he quickly moved to 39th on the restart and ultimately finished 19th. The first car McDowell passed was ARCA Racing Series driver Kyle Weatherman, who was making his NASCAR debut in Rick Ware Racing’s #51 Lilly Trucking / Spoonful of Music Foundation Chevrolet. Not long after the restart, Ty Dillon pulled his #13 GEICO Chevrolet onto pit road for a second pit stop, apparently due to damage received during his incident between McDowell and Stenhouse laps earlier. The stop dropped Dillon to three laps down, and he took last from Weatherman by the time he returned to the track on Lap 84. Three laps later, the third caution of the day came out, bringing Allmendinger into the last-place mix. Running 22nd, Allmendinger was bumped into a 360-degree spin off Turn 2 by Danica Patrick, whose #10 Warriors In Pink Ford suffered damage to the right-front. Allmendinger limped around the track with a flat left-front tire, but at the time, no other significant damage. He beat the pace car off pit road to stay on the lead lap, and lined up on the Lap 93 restart, but came back down pit road on Lap 95. Reports indicate Allmendinger’s crew discovered a broken track bar. Through it all, the “Crash Clock” was still running, and it expired during the green-flag stop, ending his day. No other driver would fall out of the race until near the halfway point, when Matt DiBenedetto had electrical issues on Go FAS Racing’s #32 Keen Parts Ford, leaving him 39th. Finishing 38th was Jeffrey Earnhardt, whose Circle Sport with The Motorsports Group crew spent several laps in the garage with a rear gear issue, returned to the track, then fell out with the issue soon after. With three races to go, Earnhardt holds a two-finish lead over Cody Ware. Ware now stands as the only driver mathematically in contention to take the title from Earnhardt, though his only path is to finish last in all three remaining races. This title may have already been clinched for two reasons. First, Cody has made just five starts in 2017 and none since Loudon on September 24. Second, Rick Ware Racing has already announced that Kyle Weatherman will drive in place of Cody at Phoenix in two weeks, and there is no news as yet if Ware will drive for another team. Rounding out the Bottom Five were 37th-place Kyle Larson, eliminated last week from Playoff contention, whose #42 First Data Chevrolet made contact with Kyle Weatherman off Turn 2 and slammed the inside wall, and 36th-place Carl Long, whose new chassis backed into the Turn 2 wall after brake trouble with 41 laps to go, leading to the race’s wild finish. In the last article of Allmendinger finishing last last year, it said there was a driver in the 47 who finished last in the 70s. But this time, you said he is the only driver to finish last in the 47. You are correct, my mistake. Bruce Hill was indeed the first driver to finish last in No. 47 at Martinsville. Guess this is a first in its own right - don't have any statistics for the "LASTCAR Statistics" section this week.